On #92 the new saffron bed and the path around the greenhouse are set up. Now we have some woodchip (albeit very leafy stuff) I can sort out a path and put pots of padron peppers out. That is, if it warms up again. It’s freezing now, what happened to all that sun?! We’re still waiting for the runner beans to come up, but haven’t given up hope. And in any case, we have bean insurances, which could also be poking up anytime soon. The greenhouse is near ly all planted up. I need to make up my mind whether to have the kiwano trailing around in there or not – by all accounts they turn into huge beasts. There are 14 tomatoes, 6 peppers and 3 aubergines planted in the ground. I’ve bought some wide brackets for shelving now the floor is planted as there are a few peppers I’d like to keep inside. 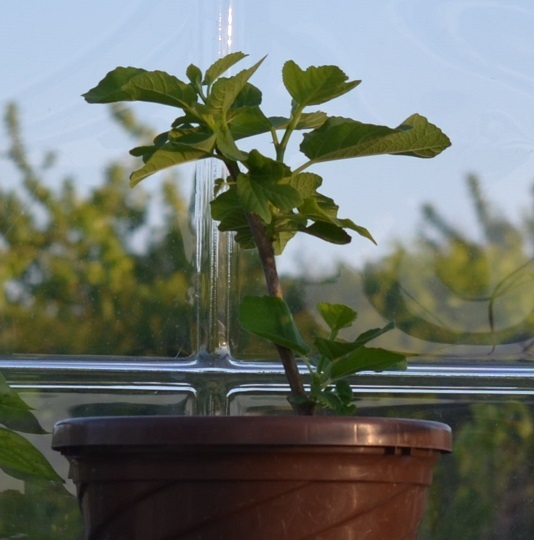 My little fig is also doing really well in there, which is brilliant! 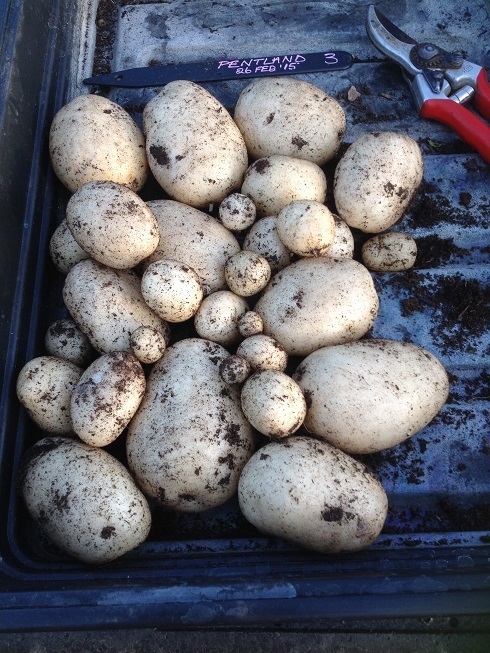 We also emptied out the potatoes from the Pentland Javelin spuds I planted in Feb. It wasn’t the biggest of harvests, but they’re tasty and will bridge the gap between now and the first highly anticipated Lady Christls. Dribble. Slugs had not been much of a problem this year, but now they have woken up. I am down 3 courgettes and 4 squashes. The Kajari melons have also disappeared. I’ve sown more (again!) in the hope that they will catch up. Sown: Genovese and Cocozelle courgettes, Kajari melons, Geraumon Martinique, Sweet Dumpling and JJarrahdale squash, Mrs Fortune and some beautiful Cara la Virgen de la Bañera Leon beans (translates as Face of our Lady of Lion’s Bath). Those beans really are incredibly pretty and came from a seed circle – I’ve not heard of them before and I can’t find them for sale online. Harvested: broad beans, rhubarb, Kent Blue mangetout, potatoes and strawberries. Not huge amounts of any bar the broad beans, but it feels like the season is finally starting.